It’s snowing! Yes it is snowing outside so let’s make some snowballs for inside as well. 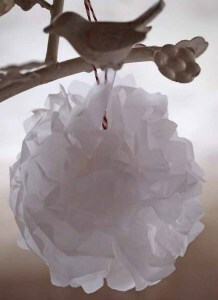 I made these paper snowballs for a demo at the Country Living Fair in Glasgow the other week and they went down a storm (snow storm of course! ), so here’s how you can do them too.